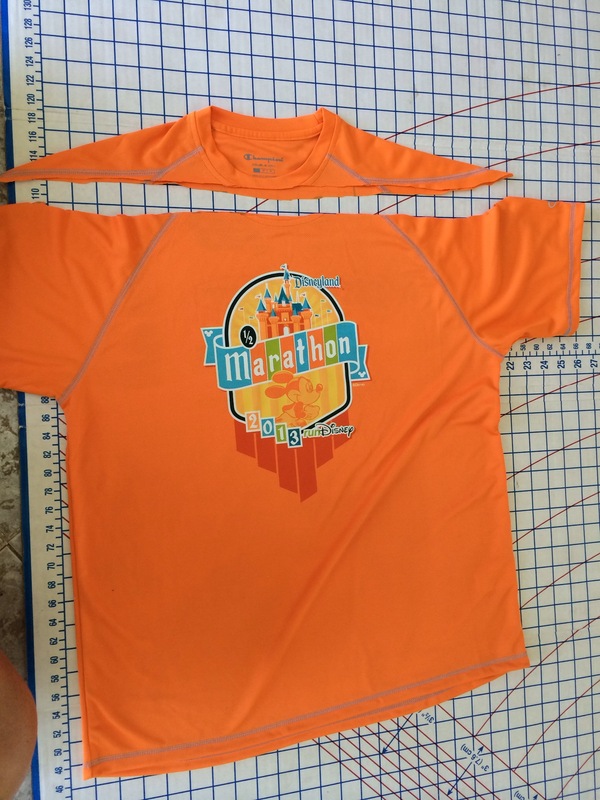 I hate that organized rides and runs always just have boxy unisex shirts. I don’t wear them so usually end up getting size large and passing them off to my dad to wear. There are some events that I keep them from but still never wear so I’ve been looking for ideas to repurpose them. Made one into a halter top and one into a loose workout tank, they worked in concept but the result was very meh on, so that was kind of a bust. 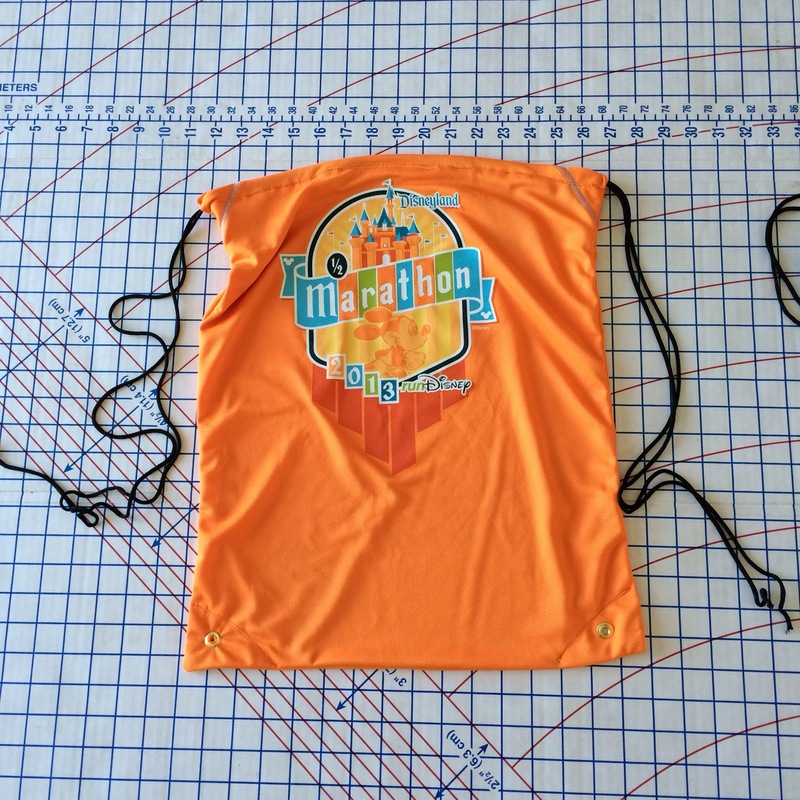 Third times the charm because this result I’m happy with – a cute drawstring bag made from my Disneyland Half shirt from last year. 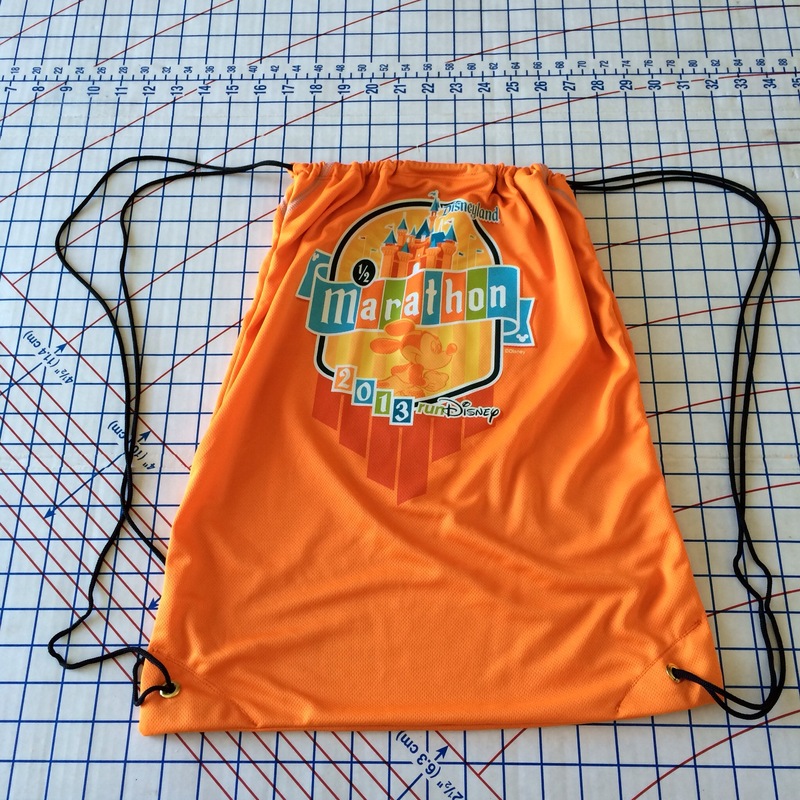 I used some other drawstring bags I had from past events as a basic concept pattern. (And yes, the bag they gave me at Tinkerbell was printed upside down. Doh!). 1. First cut the top off the shirt right across at the collar. I actually left some of the collar knowing it would be hidden so I could get the design lower on the bag. Cut bottom off shirt to get your desired bag height. I cut off about 3″ here. I also cut off the sleeves. 2. 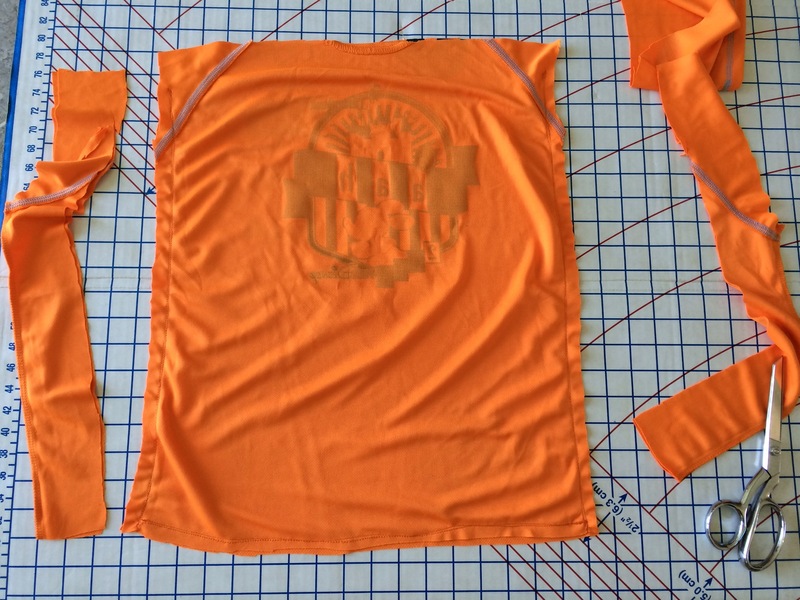 Stitch up both sides, I went 3″ from the side of the shirt, but you can do whatever width you want your bag. Only stitch up to about 1-1/2 inches from the top of the shirt. 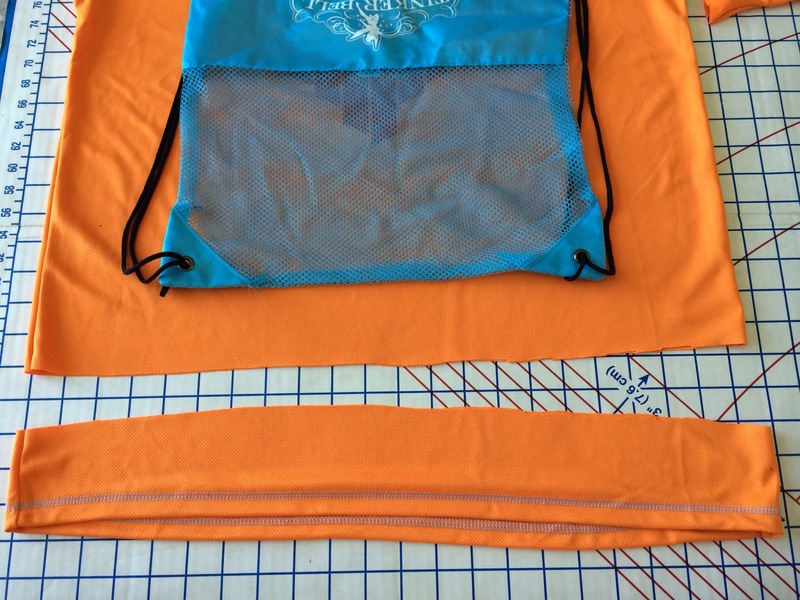 That will fold down to make the pocket for the drawstring. 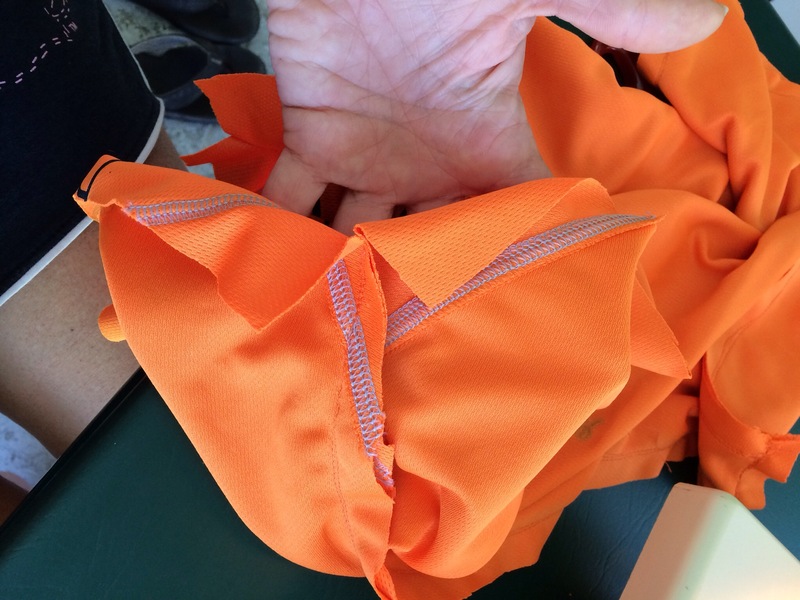 Sew bottom seam. I did two lines of stitching side by side on every seam on this project to provide more stability since I tend to stuff bags. Cut excess fabric off the sides. It should kind of look like a pillowcase at this point. 3. 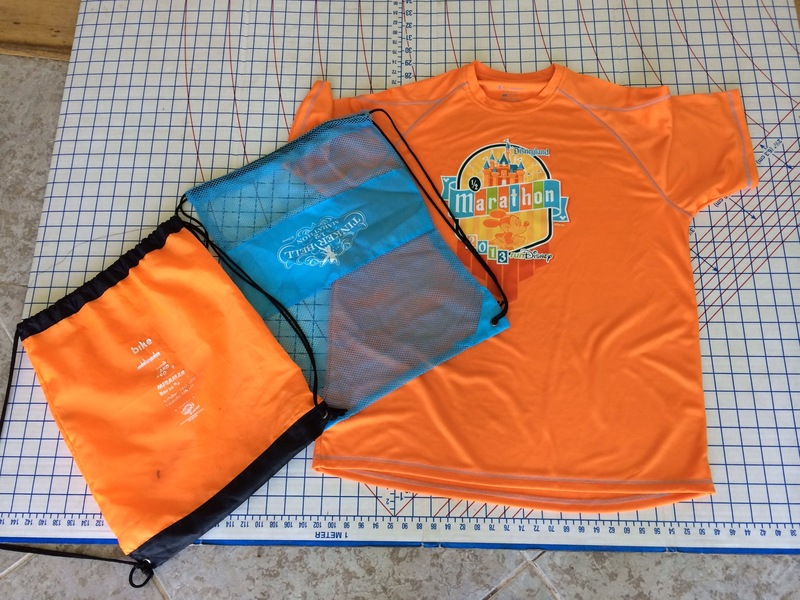 With the bag still inside out, fold down the flaps on the top of the shirt and stitch down. Do each side separately so there is a gap between the two sides. 4. Stitch across the bottom corners of the bag to reinforce. I then used a grommet gun to add the grommets. You can get one at fabric stores, I’ve had this one forever. 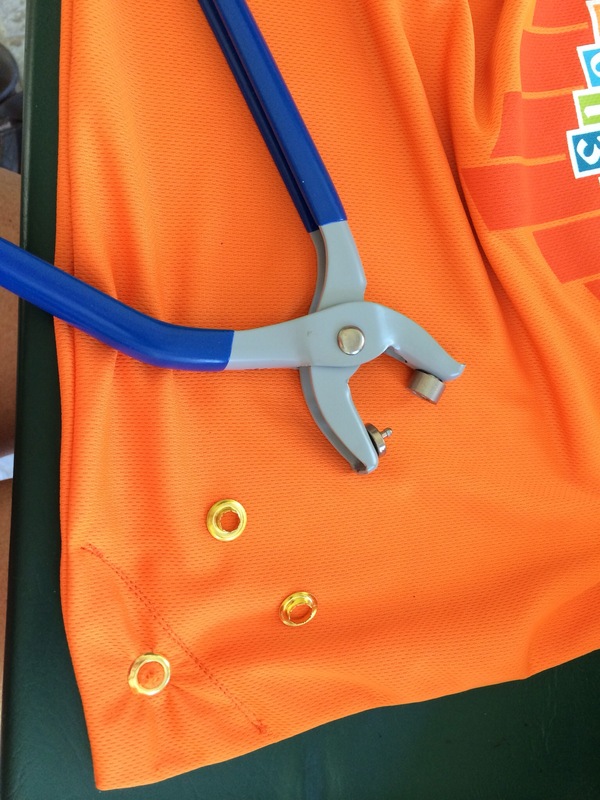 If you are doing grommets cut the hole in the fabric first and push the grommet piece thru before clamping with the gun. Forgot about that on my first attempt and the grommet popped off. If you don’t want to deal with the grommets you can just sew the string directly into the side seams, it just won’t be adjustable. 5. Take 2 lengths of cord about 1-1/2 to 2 yards each. Weave the first around the top from the right side. Weave the second around from the left. I used the cord from an old thrashed bag I got at a ride years ago but you can also buy it at fabric store by the yard. 6. 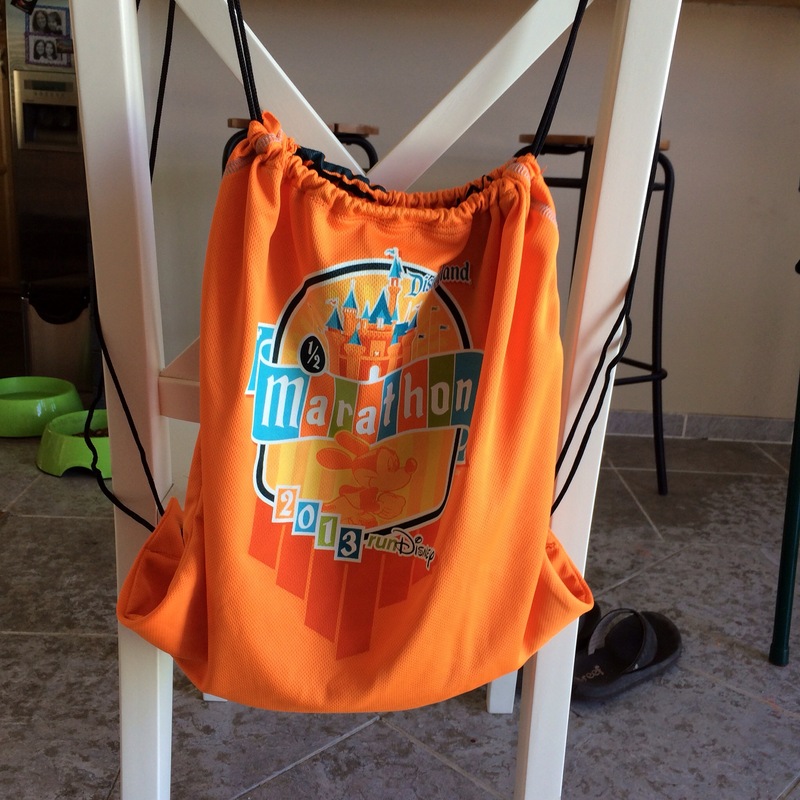 Pull both ends of the cord thru the grommets and knot on the back of the bag. Pull the strings and viola, backpack! I finished up my top for my Tower of Terror 10-miler costume last night. Oh, and remember how I said in an earlier post that I wasn’t going to rip apart the skirt and start again? Yeah, you didn’t think that was actually going to happen did you? So, I also redid the waistband on the skirt. It’s still not particularly flattering but it’s a hundred times better than it was. Just have to finalize the headwear and that costume is done. Yay! The components of my Wine & Dine costume have arrived, putting that together is next on the list. 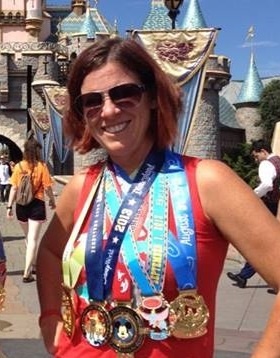 I also figured out my costume themes for the Dopey Challenge 5K, 10K and half. 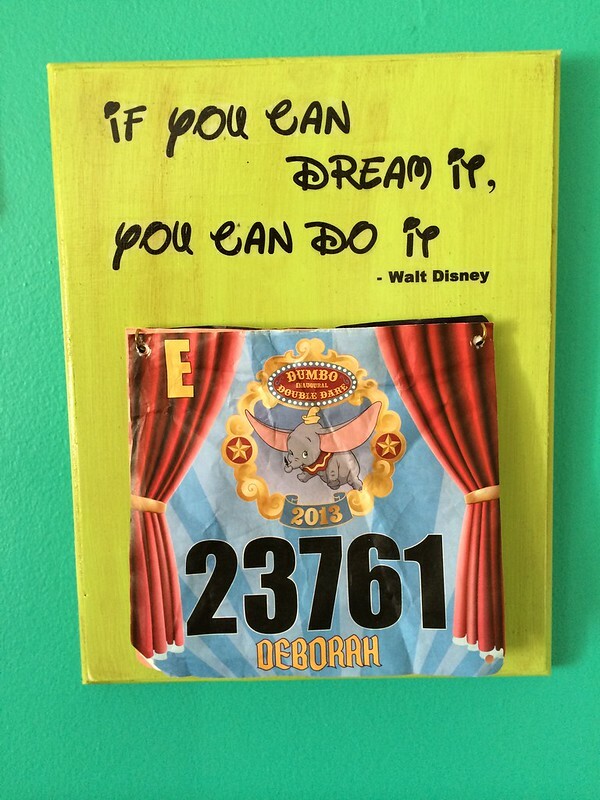 Still not sure about the marathon or either Star Wars runs yet. My other costume accomplishment was my first attempt at a Confetti Dot Fabric sparkle skirt. I used the tutorial at Beauty Still Remains. 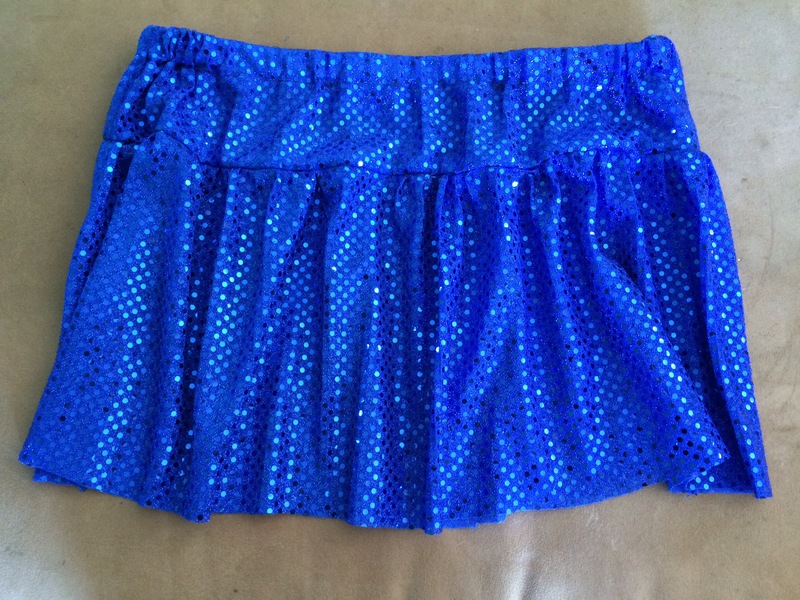 It’s a great tutorial, and the skirt is easy peasy to make. But here’s the thing you need to know about this fabric, it’s the devil. The glue holding the sequins to the fabric gum up the sewing machine needle something fierce and the thread misses, splits, bunches, etc. I may or may not have yelled at my sewing machine a few times. I finally stopped and did some googling and discovered a secret weapon. Wax paper!! Put a strip of plain old wax paper on top of the fabric and sew the seam right thru it. No more issues at all! The paper rips away from the stitching easily with no mess. With the wax paper method you can make the skirt in under 30 minutes. I fought with my machine for over an hour on the first half before discovering the wax paper method. Next skirt I’ll make the waistband a little smaller but overall I like it. These were projects that I did last weekend. People asking me how to do them was one of the motivations for this blog. Unfortunately that came after I actually did them, so no in process pics. But figured I’d post the steps anyway since it was super easy. 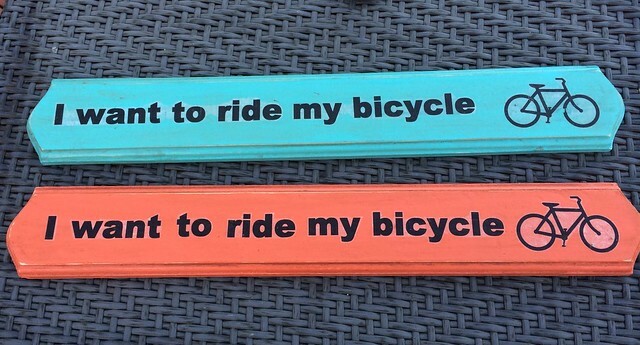 Paint the wood. I used leftover paint from my house and DIY projects. Yup, all those bright colors are in my house, no boring beige for me. Let the paint dry. Squeeze a bit of brown craft paint (or any brown paint, I’ve used porch/floor paint before) into a red party cup, add some water and stir. You basically want dark brown water. Paint the watered down paint all over the painted wood pieces, let sit for a minute and lightly wipe it with a damp cloth. This gives it an aged look. Let dry. Cut out a 8-1/2 x 11” piece of tissue paper from the standard gift wrapping folds and tape it to a piece of cardstock. Run it thru the printer and print whatever text/picture/font you want to include on your sign directly onto the tissue then take it off the cardstock. Cut out the words/pic on the tissue paper as close as you can get to the ink. Coat the top of the tissue paper and entire surface of the wood a few times with Mod Podge and let dry.